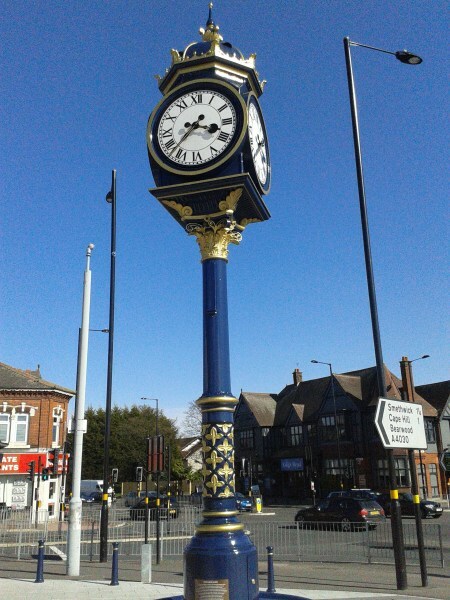 This smart blue and gold clock stands near the Kings Head pub at Bearwood. One hundred years ago it stood on the opposite side of the Hagley Road. How did it manage to cross the road? I would like to say the clock ran fast [pun intended] but it actually took a long way round. The clock was first installed next to the newly built pub in 1905. It was removed in 1971 so the road could be widened and re-appeared in High Street, Birmingham City Centre, a few years later. In 2015 it was restored and placed on the Sandwell side of Hagley Road. There are a number of these Chamberlain pillar clocks around Birmingham. They were made by J & A Law of Glasgow as gas lamps and this one now runs on electricity.